"Do you want a thing or an experience?" Anthony asked me back in July. Being my adventurous self, I undoubtedly chose the latter. But I never would have guessed that come October, we would be 1,200 feet high in the air, floating above the New Jersey Countryside. It came down to a single phone call on Saturday at 1PM. In Manhattan it was a beautiful fall day. The air was brisk with plenty of sunshine to warm our faces. The conditions in New Jersey (where we would embark on an experience of a lifetime) were still a mystery, so we gave a call to In Flight Balloon Adventures and they informed us the skies were perfect for flying! (In order to take off, the skies must be clear and the wind must be slower than 10 mph.) Anthony and I grabbed our cameras and sped off in Frankie to the land of Bruce Springsteen and The Sopranos, New Jersey. We drove from Brooklyn through Manhattan's chaotic, crowded streets and continued along Hwy 78 West for 55 miles towards Asbury, New Jersey (not to be confused with Asbury Park). We first drove through Jersey's industrial waste that lines the border of NYC. Unfortunately, this is how many people perceive New Jersey. Once we broke through the waste land that resembles a scene in Mad Max, we saw the other 99% of New Jersey which is beautiful. We were able to see breathtaking foliage, big open fields and acres of farmland. After about an hour and half of driving we took Exit 11, passed two gas stations, and continued 2.6 miles on NJ-173. The Spain Inn II Restaurant was on our right, and behind it was where we would meet our pilot and fellow passengers at 4PM. "We waited in the car excited and impatient as we watched trucks with trailers pull up." We waited in the car excited and impatient as we watched trucks with trailers pull up. Eager to meet our pilot, we stepped out of the car and shook hands with Steve, a friendly local who was going to float us up and above the trees. Soon after, we met our co-passengers, Kevin (humorously from Brooklyn also), Jocelyn, and Sosha. There were four balloons launching in total, so we had to drive a few minutes down the road to a larger field that could accommodate 105,000 cubic feet per balloon. We all hopped in Steve's blue Suburban and drove up to a farm and parked out in the field, where the corn stalks met the horizon line. Steve and Adam (our ground crewman and chase vehicle operator) unloaded the trailer. First they muscled out the woven basket, then dragged out a huge 4x4 sack that cased the balloon. We watched as they tipped the basket on it's side and unpacked the balloon from it's carrying bag. Once they managed to unroll what seemed to be miles of fabric, they connected it to the basket and burner. Next, Anthony and Kevin volunteered to hold up the opening of the balloon while a gasoline-powered fan blew the cold outside air into the envelope. The fan was so loud that it was difficult to hear as the air rushed in. We watched the balloon inflate to it's enormity second by second. Once a basic shape was established, Steve aimed the burner flame into the mouth to heat the air inside. He fired off the burner and my heart jumped with the burst of flames. I could feel the warmth against my face. It was a a magnificent site to see, the balloon slowly rose and danced gracefully against the sky blue. Once the balloon stood straight up, Steve shouted to everyone to load in. We piled in one by one, my nerves exploded throughout my entire body. "For about 45 minutes, we cruised alongside a mountain full of trees that radiated red and orange." I was so discombobulated from the sensory overload. I didn’t realize we were in the air until we were 15 feet high. The ride was so smooth that it felt like I was in a dream. For about 45 minutes, we cruised alongside a mountain full of trees that radiated red and orange. 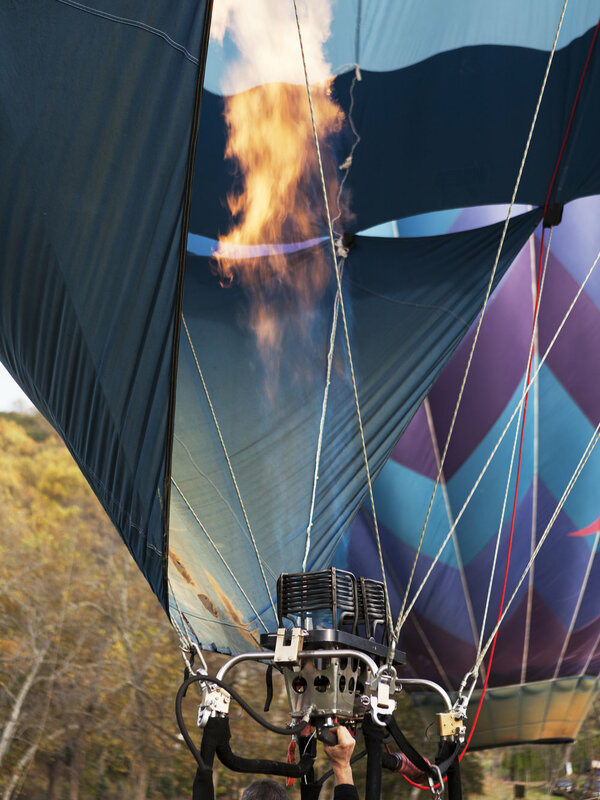 October is the busiest time for hot air ballooning, because everyone wants to see the changing leaves. At 7mph, we soared over farmland and cottages. We looked down over cornfields, and cows, constantly trying to establish our perspective. We gazed at the horizon line and watched the silhouettes of the other balloons in our group ascend from the lush countryside and descend from the heavens that were stained blue with streaks of vibrant orange. Since a hot air balloon cannot be steered (only controlled in altitude and a forward tilt or backward tilt) the landing spot is different each time. Steve and Adam talked to each over the radio to establish a landing target. I pictured Adam weaving through countryside roads as our direction kept changing. This time we would land in a suburban housing development. Steve told us to brace ourselves for a bumpy landing and to put away the cameras. We grazed the top of a tree on our way in, and bounced on the lawn once. Steve yelled out “hang on were going to bounce again!” We hopped up a few feet, hit the ground and bounced for a third and final time. Adam was there to help Steve hold down the balloon while we disembarked the basket one by one. Steve and Adam tugged down the balloon, and fought it to the ground like a cowboy fights to break a wild stallion. The neighbors came out of their homes and watched the "before dinner show." They informed us that this was the second balloon to land on that lawn that week. Slowly, one tier at a time, Steve squeezed the air out as Adam stretched out the balloon across the pristine lawn. They wrestled yards of balloon fabric back into its giant bag. Anthony and Kevin jumped in to help lift the 300 lb basket back into the trailer. After we were all loaded up, Steve ran to the front door of the house and graciously left a bottle of champagne. "Sorry about your lawn..."
We piled back into the Suburban with high spirits talking and laughing as we drove back to our original meeting point. When we arrived, champagne and appetizers were awaiting us. We clanked our glasses and celebrated our adventure. The bubbles from the champagne and cheese lined our stomachs but it was time for some real food. We asked our local pilots the best place to eat and unanimously everyone said Spain Inn II. Anthony and I weren't so keen on the decor and we usually don’t eat at places that sound like movie sequels, but we took a chance. I can honestly say looks can be deceiving. Go eat there, because their seafood is on point and delectable. We recommend the Champinones Rellenoscrab (mushrooms stuffed with crab, scallops, and shrimp) and the shrimp, chorizo, and garlic special if they have it! So go out out trying something new. It doesn’t matter if you’re afraid of heights or 1990’s decor try something new because you never know what your missing out on.